Above is my victorious entry for the Most Brooding Photograph of Buffalo in Summer 2009 contest. It is a keen competition because this has been a most brooding summer. To take my winning picture I had to climb to the top of the tower of St. Ann's Church. But do not worry. It was worth it! Can you believe those clouds? That reminds me of Artpark lastnight. What a trip that was! All day long after writing that thing yesterday about rain I was telling myself it would not be that bad. It is just Lewiston, I said. It is not Nebraska or the Yukon. But it turned out it was that bad! Things started out well. When my mom and I go to Artpark we pack a picnic. I made a green bean salad for the picnic out of the green beans I had just picked up from the farm and as I was steaming the beans, the rain stopped and the sun came out. Good, good! Then we drove to Artpark and the sun stayed out. Miraculous! We dined at a picnic table overlooking the gorge. That is so Buffalo! This world-class tourist-attraction gorge and it is two feet from your toes. Through the trees if you look closely you can see the deep green water. Once in a catalog I saw a color identified as Niagara and it was just that deep blue green. Then the concert was unbelievable. It was so great. It was Laura Aikin, this soprano from Clarence, with the Buffalo Philharmonic Orchestra, and she is a tremendous singer and she just gave the concert her all, which was the important thing. So now I am relaxing and rejoicing. I am a winner, I am saying. But then came the ride home. And right on cue, the rain whipped in. I drove the THE WORST RAINSTORM OF MY LIFE!! I will say this for myself: I never lost my cool or snapped or became impatient. But I sure felt like it! My mother was making things worse by praying. I mean, I was fine with one Hail Mary and one prayer to St. Christopher but after that I am through, I am out. That is what I told Howard later when I could look back on things and laugh. Isn't this a darling statue of St. Christopher? It is in the Cologne Cathedral. 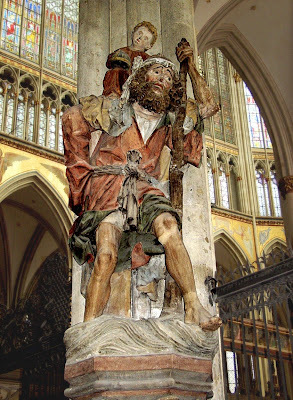 That statue makes St. Christopher look like something out of the Brothers Grimm. 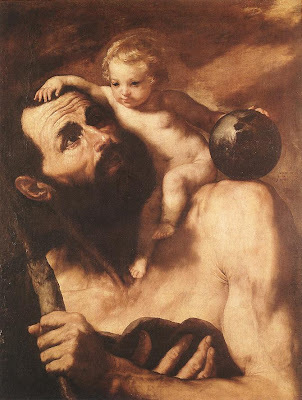 Legend has it St. Christopher was a giant. Here he is looking Spanish. This painting is in a gallery in Madrid. 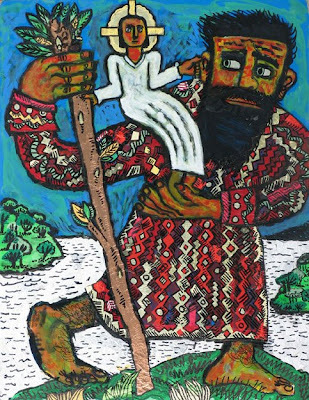 All these images of St. Christopher have such a tenderness. Here is one other one I like. To be honest I was saying my own private prayers to St. Christopher as the drive proceeded. Because it was not pretty. On the Youngmann it was raining so hard I could not see. What are you going to do? The wipers were going as fast as they could go and I could not pull over and stop and wait because I had this deadline. So I was driving and trying to follow the guardrail at the side of the road. I was humming "Una voce poco fa" from "The Barber of Seville" to steady my nerves. That was one of the arias Laura Aikin had sung. "Get off at Millersport," my mother suggested. But I do not know that exit and what, I was going to drive around in this storm and be lost? So I said I would continue to Main Street. But meanwhile there was another exit in between, the exit for Harlem and Sheridan. I am thinking, oh, I forgot about this exit. And my heart is sinking. It is always something, I am thinking. Finally we reached the longed for, the hallowed Main Street exit. Swish, swish, swish go the windshield wipers. We pass the Lord Amherst where Leonard Pennario used to stay all the time and I pull onto my mom's street. So my mother was able to disembark and go into the house without getting a drop on her. I was standing in the driveway still shaking. Then I got back in the car and drove home without incident and I made it with still 18 minutes to go before my deadline. I had to self-medicate with a glass of Tisdale. Thank you, Tisdale! Wow! All of that was so vivid to me! It was like I was there with you guys, lol! Nice writing! Sorry you got caught in the rain. I was at Home Depot on Elmwood at the time of this freak rainstorm. My domesticated partner made me go out and buy 4 bags of paver sand, for some crazy project he's working on. Of course, as soon as I got to the exit of Home Depot, it started pouring. Cats and dogs isn't sufficient to describe it. It was coming down in buckets! No, that's not sufficient either. I refused to leave the lobby of Home Depot. I just stood there and waited with my cart full of sand bags until it was over. Boy, I'm sure glad I wasn't driving on the 290! I like how you just casually mentioned that you took that photo from the tower of St. Ann's Church. What were you doing up there? That's my favorite church in all of Buffalo. As luck would have it, that although he has been removed offiicially from the Catholic calendar of saints, July 25th, yesterday, was the Feast of St Christopher.